“Jam-packed” might be a good way to describe last week’s meeting. We had an informative presentation by one of the pioneers of the Oregon wine industry, and lots of guests, including some of the international youth exchange students and three newer members of the Early Birds club. 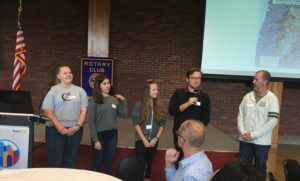 Dave Benson, right, a member of the Youth Exchange Committee, introduced some of the students who participate in what he called “one of Rotary’s most exciting programs.” Kathryn Lawson, left, spent the summer in Germany. Clara Perez, second from left, is here this year from Argentina. Danielle Bosse, second from right, studied in Argentina. Neves Eryigit, second from right, is here from Turkey. The exchange students are fundraising to buy ShelterBoxes to give to some of the families affected by the recent natural disasters. Each ShelterBox contains a tent, water purification kit, blanket, tools and other necessities to help a family in need. An international dinner and auction will be held October 1st at Windrose Conference Center starting at 4pm. Please email Paula Radich by 5pm Tuesday the 26th if you are interested, as space is extremely limited. Steve Palmer introduces our guest speaker. 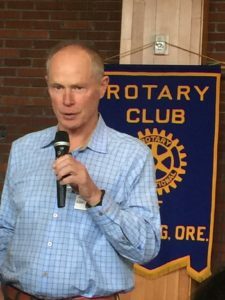 Steve Palmer introduced our speaker, Alan Holstein, formerly of Argyle Winery and member of the “Oregon Wine Walk of Fame.” Steve mentioned that he and Jack Czarnecki solicit wine for our annual auction, and that Alan was always very generous in making donations. Alan recently stepped down at Argyle, and he and his son now each have their own private wine label. 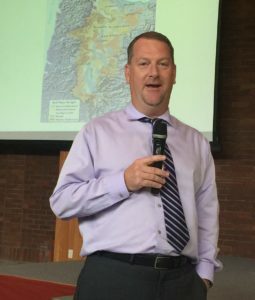 He explained there are six designated wine grape-growing regions, called American Viticultural Areas (AVAs), in Yamhill County. “I’m going to talk about three– Yamhill Carlton, Dundee Hills and Eola-Amity,” he said. The other three are Chehalem Mountains, Ribbon Ridge and McMinnville Foothills. To answer his original question, Alan did a “deep dive” into our area’s environmental factors and the geologic background of the soils. He explained that environment is defined as people interacting with the plants and the soil. Alan explained how the unique soils of the area came to be. First, there was the geologic process of “accretion,” where the “ocean plate slid under the continental plate.” Then there was subduction, and pressure from the two plates colliding created the hills. Fifteen million years ago, there was a volcanic eruption that covered parts of Washington, Oregon and Idaho. That resulted in the Columbia River basalt flows. A second geologic event, the Missoula floods, also influenced the formation and structure of the soil. “Today, we can even see a color difference in the soils from the two events,” he said. Sharon Champagne from Guild Mortgage, Stewart Brown Group, and Ashley Mumm, who attended for the second week in a row, were guests of Om Sukheenai. Jim McMaster introduced Jennifer Marsicek, lead architect on the new aquatic center. 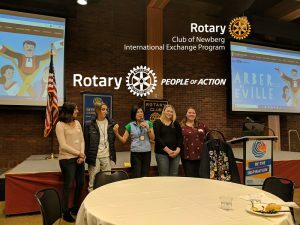 Last week’s meeting featured a two-part program: A Classification Talk by new member Rachel Huber and a briefing on an exciting new program at Newberg High School by Matt Miller. Rachel Huber does her Classification Talk. Education was very important to her family. Rachel graduated from high school in 2002, and took college courses while there. She was able to get into nursing school in California and while there, met her husband, and moved. She joined Avamere four years ago and became a certified nursing assistant. When the person in the marketing position left last January, her boss asked if she would like to try it out. She jumped on the opportunity to work toward making it her full-time job and took online classes to learn more. In the short term, Rachel would like to become an executive director of an Avamere facility. Matt Miller explains the IDS project. “Education must shift from instruction to discovery–to probing and exploration.” This quote from Marshall McLuhan on a flier handed out by Matt Miller pretty much sums up the philosophy behind the new Integrated Design Studio (IDS) at Newberg High School. Dave Parker introduced Matt, saying that the School District is very excited about this new program and lucky to have hired Matt. “We saw a documentary on Netflix about the concept. 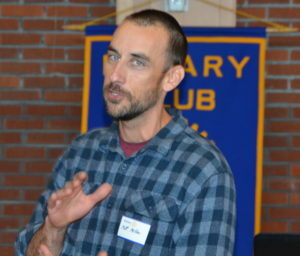 Matt started in North Carolina and we found him in Oregon City,” Dave said. According to the flier, the studio offers a multi-disciplinary, project-based approach to teaching and learning. The students are thinkers AND makers, designers AND builders, hacks AND hipsters, future plumber AND physicians. At NHS, the program has 30 students in two groups. There’s a period of design, of engineering and of math–three teachers, one classroom, and one big, student-led project. 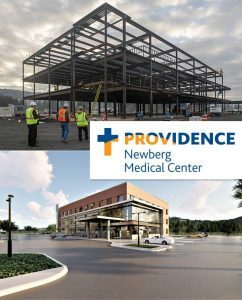 The big idea with IDS, according to the flier, is to design and build a small, but significant piece of architecture in Newberg each year that addresses a current issue. Matt showed photos of projects his former students had done: a farm stand for a community, which created jobs, and a concessions stand at a high school. 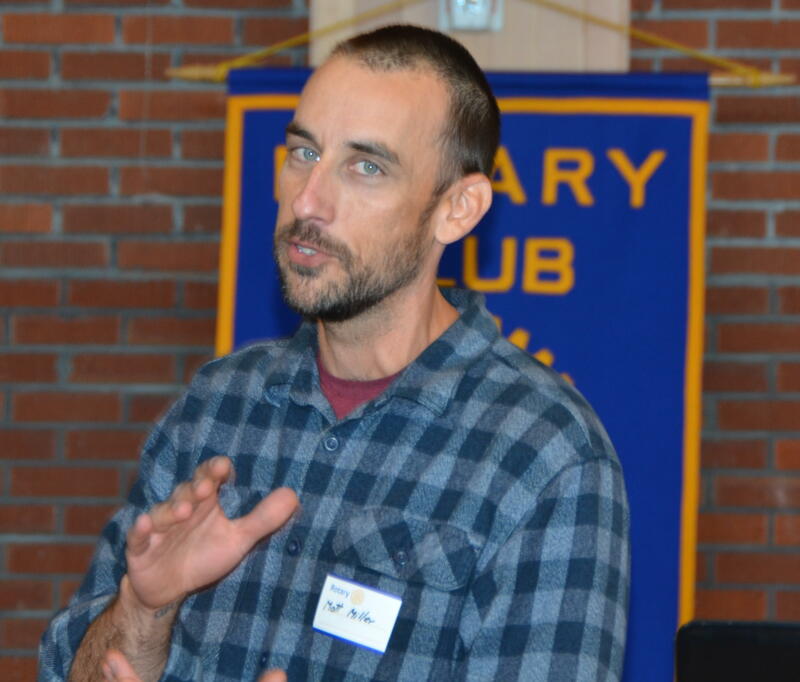 If you have “ideas, thoughts or tools,” please contact Matt at 510-227-0481 or at millerma@newberg..k12.or.us. and Chase Estep, with Chase Estep Digital Marketing. He announced he will be having a workshop on Facebook advertising on Sept. 26. For more info, go to ChaseEstepMarketing@gmail.com. Marni Tilrico, Laura Tilrico‘s sister-in-law, also joined us for lunch. Reminder! 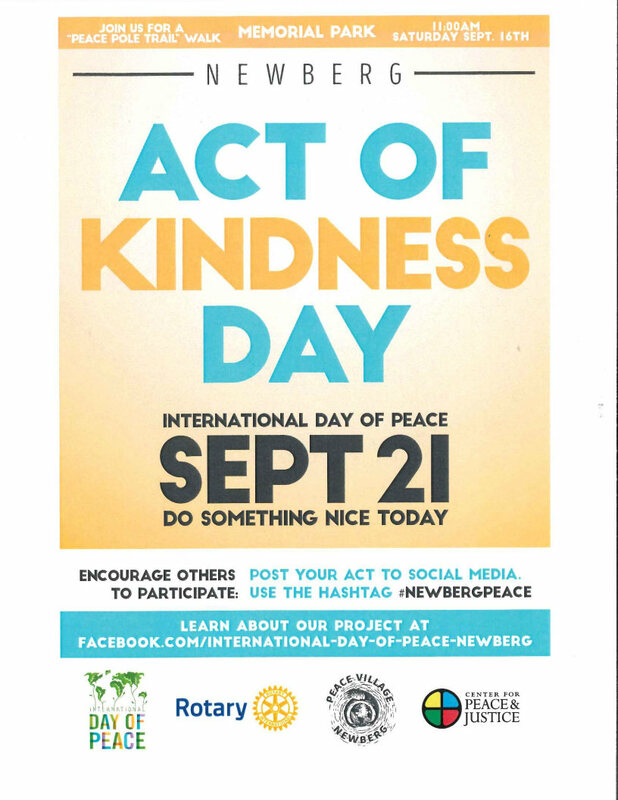 This Thursday is the second annual “Act of Kindness Day–Newberg” to commemorate the International Day of Peace. Do something nice for someone you don’t know to help make a great community even better! Tony Lelack reported that dictionaries for our service project related to the Literacy Area of Focus have been ordered. Volunteers will be needed soon to help distribute them. Paula Radich announced she will head up the new “Friends of Rotary” program. If you know of people who might be good candidates, or if you would like to help Paula, please let her know. Denise Bacon invited us all to the Police Foundation Dinner on Sept. 29 at 5:30pm at the Chehalem Cultural Center. Funds raised will support the canine training program and help provide needed supplies. For tickets, please check with Denise. Paul Jellum announced that applications are now open for the exchange student program for the next academic year. Both short- and long-term programs are available. If you know someone who might be interested, please contact Paul. When’s the last time someone read to you? Walter read to us last week. If you were at our meeting last week, it was probably when Walter Want read “The Pigeon Finds A Hot Dog” to our club. It was priceless. With his flair for dramatic emphasis, it was obvious why Walter is one of the favorite volunteer readers in the local SMART–Start Making A Reader Today–program. Walter has been our club’s coordinator for this literacy service project for a number of years. 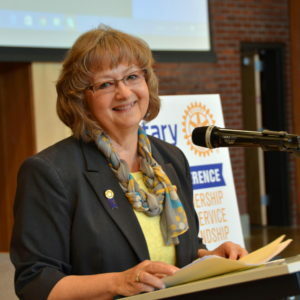 Since Sept. 8 was National Literacy Day, and Literacy is one of Rotary’s 6 Areas of Focus, the SMART program was a timely topic. Walter invited Linda Ochiltree and Julie Firth, local SMART coordinators, to update us on the program. 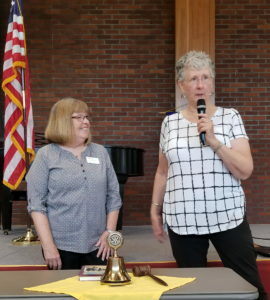 Julie Firth, left and Linda Ochiltree, local SMART program coordinators. SMART is celebrating its 25th anniversary this year. 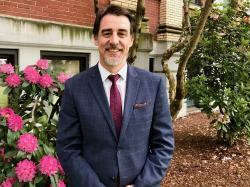 It was founded in 1992 by Neil Goldschmidt when Oregon schoolkids were found to be falling behind national standards in reading. According to their website, SMART is a non-profit, volunteer-driven tutoring program local to Oregon for at-risk K-3 readers. It has grown from serving 585 children at 8 schools at its inception to serving 7,244 children at 223 sites in 2011. The SMART concept involves each student getting one-on-one attention for 60 minutes per week as they read with a volunteer to help boost their confidence in their reading ability. Additionally, the students get to take two books home each month over the seven months the program runs each year (mid-October to mid-May), in order to make more reading material available at home. Local SMART volunteers read with students at Edwards and Joan Austin elementary schools. 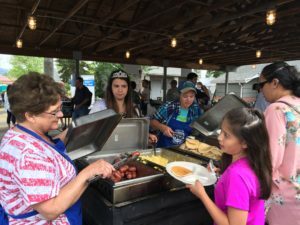 If you are interested in being a volunteer, you can sign up and get your background check online at getsmartoregon.org. Linda recommends starting out as a substitute to give the program a try. Supporting SMART is just one of a number of ways our club supports learning. 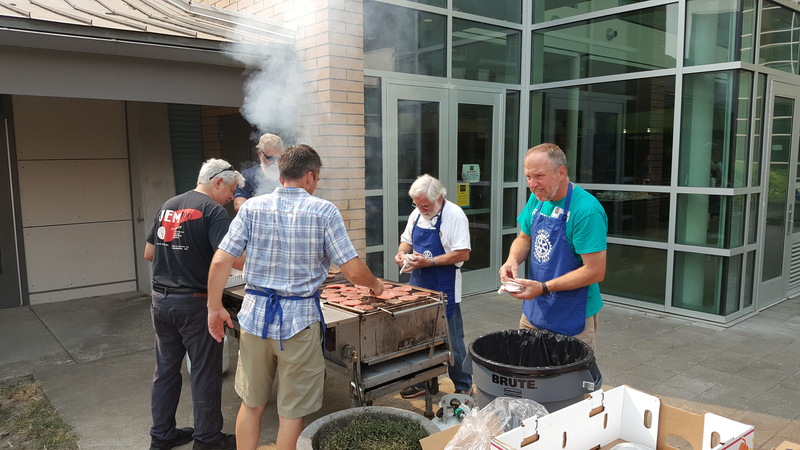 With our scholarships, our support of the Newberg Library’s summer reading program, and the dictionary project, we are people of action in this area of focus! 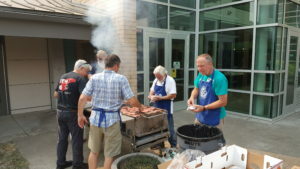 Walter Want (center) and Corey Zielsdorf (back to camera) join volunteers from the Early Bird club to cook hamburgers for the “Welcome Freshmen” lunch at Newberg High School Sept. 5th. Shannon Buckmaster brought her neighbor, Emily Chlumak, who was interested in checking out Rotary. Jack Czarnecki’s wife, Heidi, also joined us for lunch. 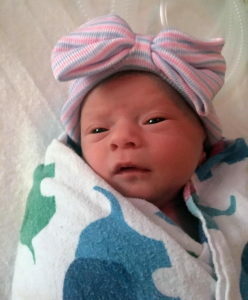 Welcome to the world, Amelia Aylor! Congrats to our two first-time dads! Andrew Aylor and his wife welcomed a baby girl, Amelia (right), born Sept. 5th. Dan Keuler and his wife welcomed a son, Jackson, born Sept. 3rd. This Saturday, Sept. 16, at 11 am is the “Peace Pole Trail Walk” in commemoration of the International Day of Peace. Join us at Memorial Park for a short walk that connects some of the 50 poles planted recently by our club and community. 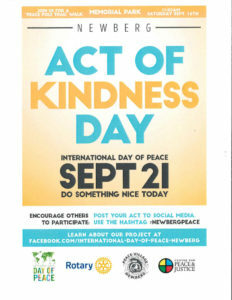 And on Sept. 21st, please join in on our “Random Act of Kindness–Newberg” Day. Just do something nice for someone you don’t know to help make our community an even nicer place to live. Seems like a long way off, but it’ll be here before we know it: Saturday, Dec. 2 is the date for the Christmas Tree Lighting at the Library this year. 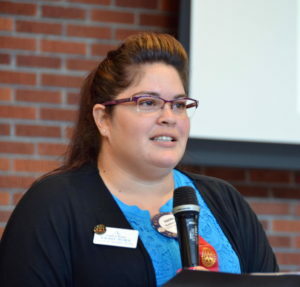 Our New District Governor, Renee Campbell, was our special guest and speaker last week, and left us informed, inspired and proud to be Rotarians. 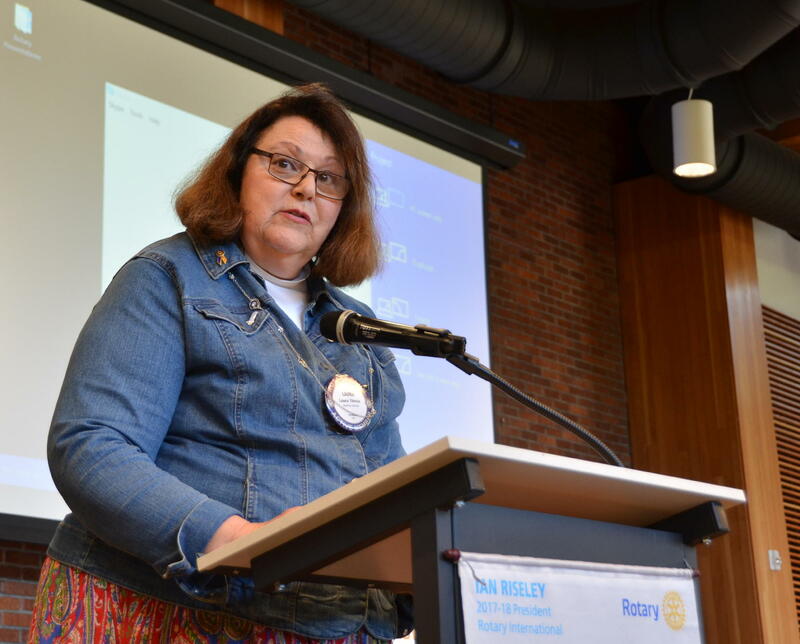 Accompanied by her husband, Ron, Renee covered a lot of ground in her talk…..from her reasons for joining Rotary to the organization’s role to the future outlook for our clubs. 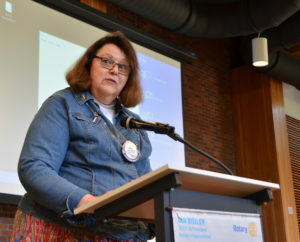 Renee shared that she is originally from Pendleton, and discovered Rotary by being invited to a meeting by one of her printing business customers in Salem. The last of their six children had left the nest, and she felt the timing was right. 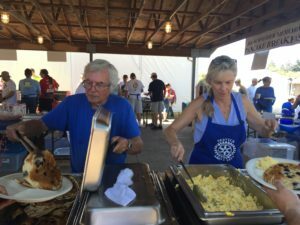 She was ready to give back, “and the combination of great friendships plus the opportunity to serve” that Rotary offered was just what she was looking for. 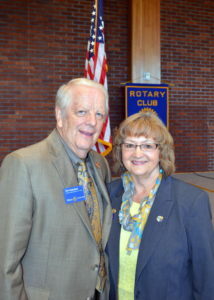 DG Renee Campbell with husband, Ron. According to Renee, the new Rotary president, Ian Riseley, has chosen the theme “Making a Difference” this year. 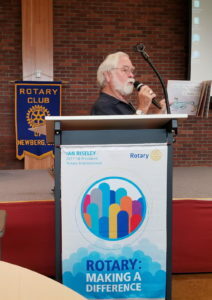 He was very moved after seeing the Rotary wheel in a photo of a little girl being helped after the Chernobyl disaster. 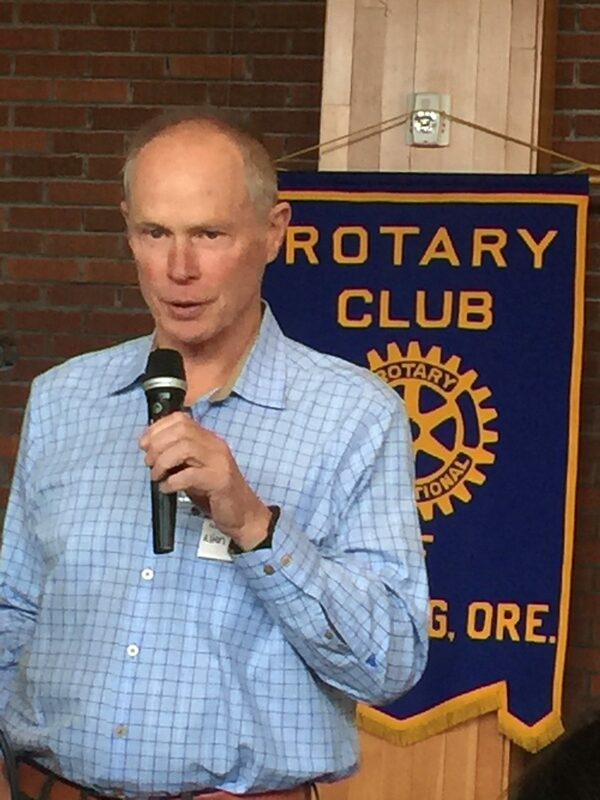 It made him think about the “power of the wheel” and all the good things Rotary does worldwide. To help with marketing, Renee said some new tools–including an ad campaign– are available at the brand center online. She recommended identifying prospective members and inviting them to a meeting. She said Rotarians are “mostly seasoned professionals. Young people have time for Rotary, but not necessarily time for meetings.” New developments, like “Friends of Rotary,” may help. She said 33% of members in the District currently are women, and 6% are under 40. “What will your club look like in 10 years?” she asked. “Share the Rotary story, share your club story, share your personal story” to attract new people. We are Rotarians. We make a difference. Past District Governor Tom Markos also attended our meeting. 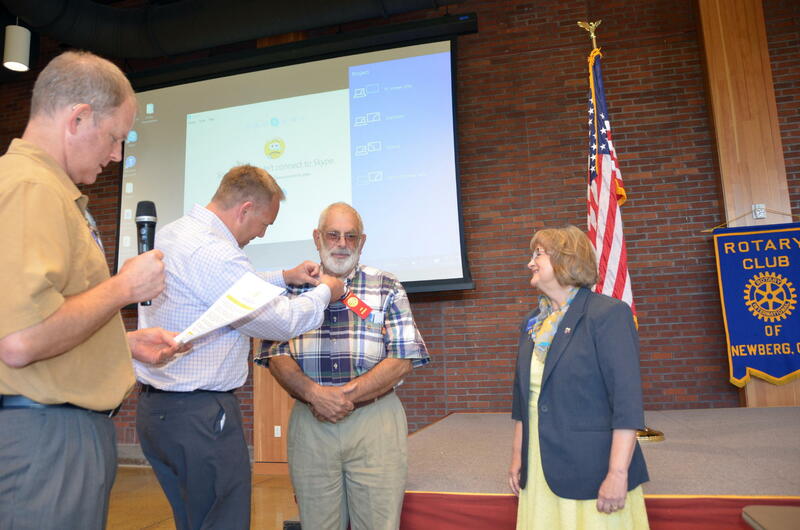 Tom is now serving as the District Rotary Foundation Chair in charge of district grants. He was there to present a special “major donor” award to Mike and Amy Caruso. Congratulations and thank you, Mike and Amy! DG Renee Campbell gives Mike Caruso a special pin, while PDG Tom Markos presents him with a crystal “major donor” award. International Chair Laura Tilrico gave an update on global grants. One is now in the works for the town of San Mateo in Guatemala. Lynn Montoya Quinn did a needs assessment in the town during the last dental trip, and found they needed a rain catchment system. Total cost is $105,150. $17,000 will be coming from our club foundation. Laura also mentioned that last year’s grant for a clean drinking water project in the town of Godamchour in Nepal is winding down. Trenches are being dug to connect to individual homes. Note: Dates have been set for the next dental trip: March 4 through 9, 2018.
International Chair Laura Tilrico discusses global grants. He made it! 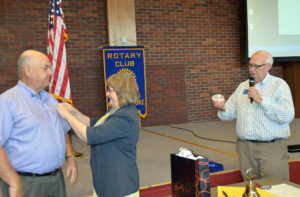 Dr. Rick Kaufman was officially installed as a member of our club last week. The retired dentist transferred here after 10 years with the Jacksonville Club and, all told, has 49 years of impressive service in Rotary. He is now the owner of WoodArt, and enjoys bonsai, camping and cars. Welcome, Rick! President Todd Engle, Membership Chair Mike Boock, and DG Renee Campbell induct Dr. Rick into our club. After her talk, DG Renee mentioned that she likes to recognize a member in each club who best represents “the essence” of Rotary….leadership, service, friendship and fun. She asked President Todd Engle for a nominee from our club and he said he knew just the person: Paula Radich! Congratulations, Paula. 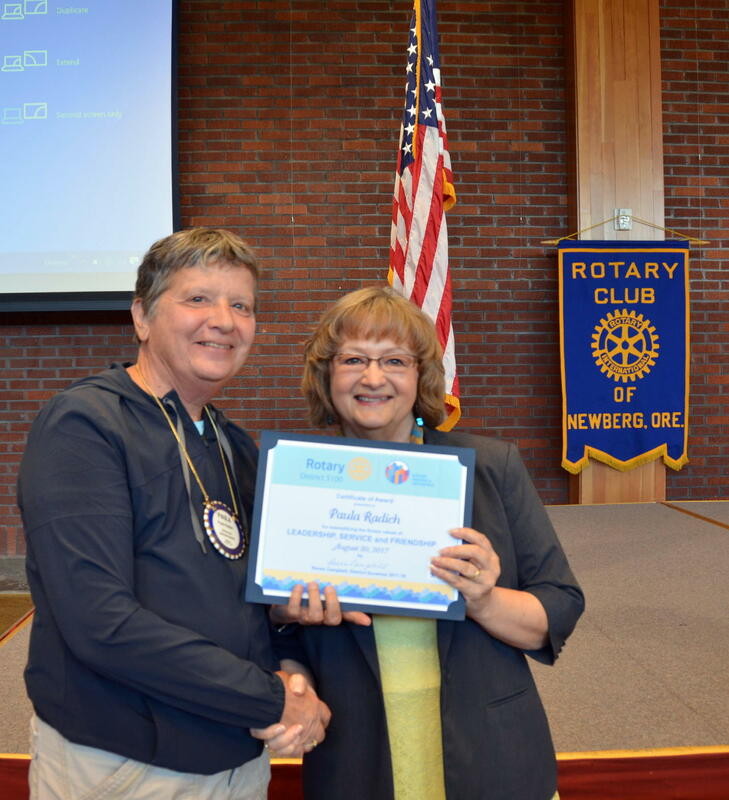 Paula Radich receives well-deserved recognition from DG Renee Campbell.